This timeless recipe for dairy-free, gluten-free Strawberry Rhubarb Crumble was shared with us years ago by Meghan Telpner, and I thought it deserved a revival. Meghan and I first crossed paths close to ten years ago. She appeared in the online world with a blog, vanished for a while, and then reemerged as this unstoppable force of health and lifestyle positivism. She’s become a Certified Nutritionist and Holistic Lifestyle Consultant, spreading the word of nutrition and good life choices through her book, UnDiet: The Shiny, Happy, Vibrant, Gluten-Free, Plant-Based Way To Look Better, Feel Better, And Live Better Each And Every Day!, and via every other avenue imaginable – videos, TV, classes, etc. Her book is an all-inclusive how to on living well, but she does include some of her favorite virtuous recipes, similar to this strawberry rhubarb crumble. As for the “butter-less” aspect of her recipe, butter seems to be the base for most crisps, crumbles and cobblers, but like Meghan, I enjoy using coconut oil instead. I think the only difference between our techniques is that I would add a touch of salt to the topping for this strawberry rhubarb crumble (to bring out the flavor in the spices), and Meghan adventures using more natural liquid sweetener than I have yet to try! Made this last weekend it was yummy especially with vanilla bean ice cream! By ingredients, this recipe is dairy-free / non-dairy, egg-free, gluten-free, peanut-free, soy-free, optionally vegan / plant-based, and vegetarian. For a nut-free strawberry rhubarb crumble, substitute more rolled oats for the almonds. Not gluten-free? 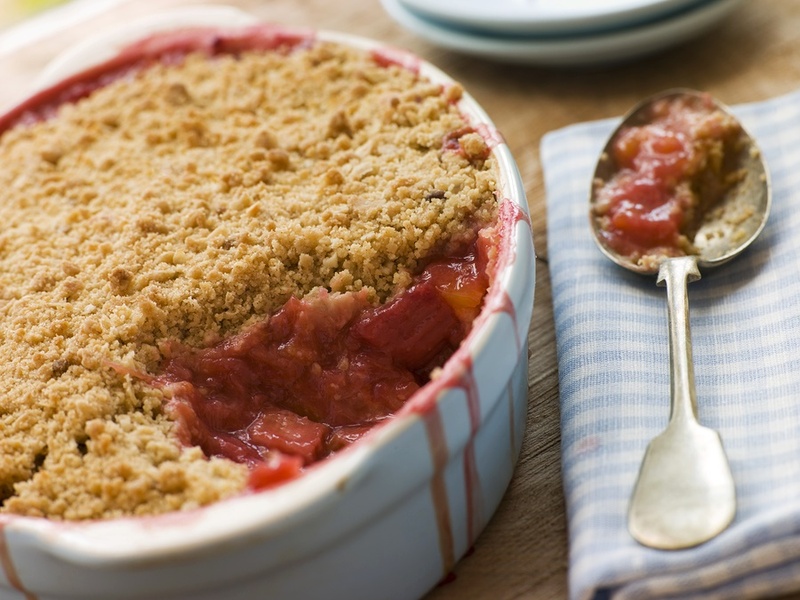 You can use a wheat-based flour in this strawberry rhubarb crumble, if desired. You can even go all the way with the oats, using oat flour, or certified gluten-free oat flour, for the flour. In a large bowl, combine the strawberries, rhubarb, and ½ cup of the honey. Spread the mixture evenly in an 8x8-inch ungreased pan. In a medium-sized bowl, combine the flour, oats, almonds, sugar, cinnamon, and allspice. Stir in the honey, and cut in the coconut oil with a fork or pastry blender until you get a nice crumbly mixture. Sprinkle this mixture evenly over the fruit in your pan. Bake for 40 to 50 minutes, or until the top is golden. Serve with dairy-free ice cream (even better if it is homemade! ), if desired. 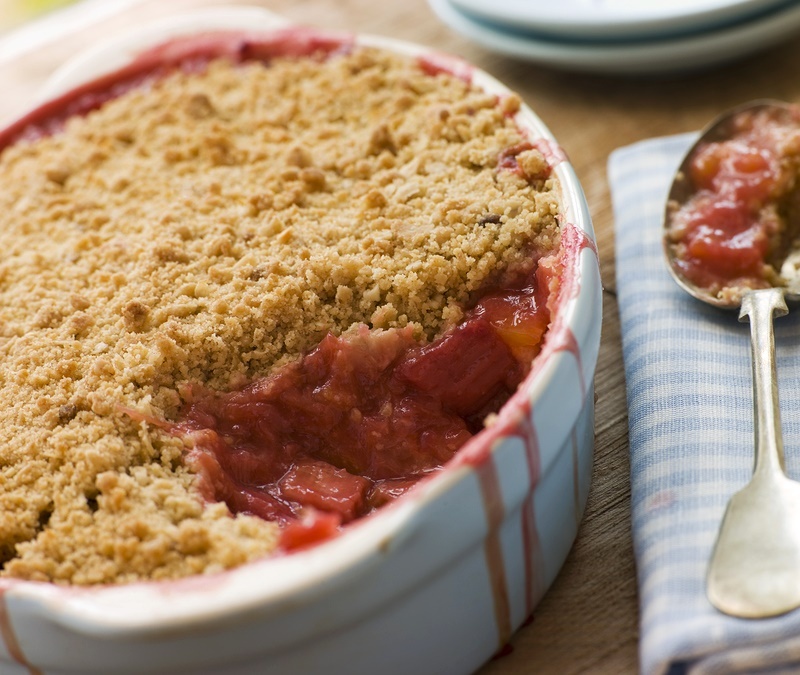 Single Serve: You can bake this crumble in individual ramekins, if preferred. Start checking for doneness at around 30 minutes. The top should be golden and the filling a bit bubbly. I love this recipe I have used it many times. Everything I make is dairy-free because of my intolerance to dairy. And because of your recipe I have started to use coconut oil in many things, generally as a substitute for dairy free butter. It has worked out great and so many people love it when I make this dish. My crust topping always comes out to be more like cookie batter than a crumble. I wasn’t sure if I should just add a little more flour or try chilling the coconut oil. The coconut oil always seems to be melting a bit do to the hot weather where I am. Or if there is something else that might be the problem. If you want the texture to stay the same once baked, then I would just chill the coconut oil. If you don’t mind a little change in texture (and a touch less sweet), then you can add more flour until crumbs form. Both will still be delicious! Sounds like a great recipe! can I use almond flour as an alternative? Almond flour will probably work Dini, but I haven’t tested it. Could this be made ahead, frozen and then reheated? Would you fully cook it or make it, freeze and cook when serving? Personally, I would fully cook and freeze it Kara. And then reheat in the oven. I think if you freeze before baking, the filling could end up quite mushy. I made the crumb topping and would like to add some words of advice…. My didn’t look like yours, and that’s what I was looking for but the oats were clearly seen; so next time I would either pulse the oats first or use steel cut in order for it be true to a crumb consistency. I didn’t use nuts but later thought it probably would have be a great idea to use ground flax seed. I did only use coconut flour and that gave it truly a crumbly effect. So I’ll try this recipe again with those impervisions. It did look pretty from the oats just not what I was going for. Thank you for your notes on this Devona! Thank you for posting this recipe that I’m going to try this weekend for my friend’s birthday (she’s on a strict no-dairy, no-gluten diet at the moment). Being French, I’m not used to measuring cups for baking. What does one cup corresponds to in ml? I hope both you and your friend enjoy the recipe! I would definitely add thickener like starch if using frozen as it will be even more watery – but it could work. Love this recipie! Just made it yesterday and it made the whole house smell unbelievable. One issue was that the fruit bit turned out very watery. I’m definitely going to try this one again, but I was wondering if i could’ve done something different to make it more thick. Maybe my strawberries were really water-filled? Hi Kaitlyn, you can add a little starch or even ground chia (for more nutritious) to the fruit mixture to help soak up any liquid. Glad you enjoyed otherwise! I’m a big fan of the strawberry/rhubarb combo, but would you believe I never made anything with it?! I need to. This is beautiful and I love the use of coconut oil here! You do! I swear though, strawberry goes with almost every flavor! I definitely do not need butter to get excited about this crisp. It looks awesome! I love this recipe! Not only do I really appreciate that it is gluten-free, I love how you shared SO MANY different variations I can use. I don’t have a particularly strict diet, so it is really nice to know all of the different options based on what I have available. Based on the way you wrote up this recipe, I know that I can make a delicious version without having to run to the store for something specific! I do my best with the options since my viewers have such diverse needs – glad you like it! This looks fantastic! Since I’m new to using coconut oil, I just have a quick question – when you say cold-pressed coconut oil, is it the stuff from the jar just not melted? It sounds silly, but I would like to make this the right way, and will be going dairy-free soon. There are no silly questions – okay, there are a few, but this isn’t one of them! It is really just referring to refined vs unrefined. For this recipe, we like the unrefined taste and health benefits, but if you want to avoid almost all traces of coconut flavor, then you can use refined – both will work the same. You do want the oil to be solid or soft, but not melted, so that you can cut it in. Enjoy! I’ve never made a fruit crumble! That needs to change because this looks so sweet and yummy! Wow- I always hark on that the best part about a crumble is the buttery texture but wow- This looks delicious and rich without it!